There’s a lengthy article over here written by a well-meaning but perhaps slightly self-deluding Sony apologist, detailing nine reasons why Blu-ray will succeed. It’s worth checking out, but it’s pretty clearly the view from one side. So take a look and then come back and see if you agree with our tempering of that laudable but unwarranted optimism. Ready? Then let’s begin the deconstruction. Let’s take it step by step. 1. Digital downloads will not eliminate the need for discs anytime soon. “Soon” is a relative term, and it’s not a question of if but when. That lends a certain doomed air to the whole Blu-ray setup; it’s like buying a ticket for a ship that everyone knows is sinking, but no one knows how fast. Sure, a lot of people have crappy connections now and streaming video isn’t as high quality by a good measure, but that gap is constantly narrowing and it’s not all going to be streaming anyway. A high-def movie with perfectly good compression takes up perhaps 10GB. That means you can fit 50 on a $100 hard drive. That sort of proposition is finding more and more willing participants. 2. Having one clear standard is a big advantage. Kind of true. But the benefit of a versatile platform (a PC or set-top box) is that the “standard” isn’t: it can change without affecting end users. Re-encode your library to be smaller, or download a new version with better image quality. Push a firmware upgrade with better noise reduction. Download a new player that offers more and better features. We’re no longer setting hardware standards like before; we had standards for videotapes, and it would have been nice to have them for things like memory cards, but now we’re beyond the physical restrictions that were the main reason a “clear standard” was advantageous. 3. Blu-ray isn’t going to be replaced by another disc format anytime soon. No, it’s not going to be replaced by another disc format, but it’s already being replaced by another storage format. Hard drives are cheaper per gig, more convenient, and already in half the devices we own. The optical drive is on its way out; a new disc format would be like a new extra-long-play VHS tape in 2000. 4. Prices for large-screen HDTVs will continue to drop. 5. Prices for Blu-ray players will continue to drop. 6. 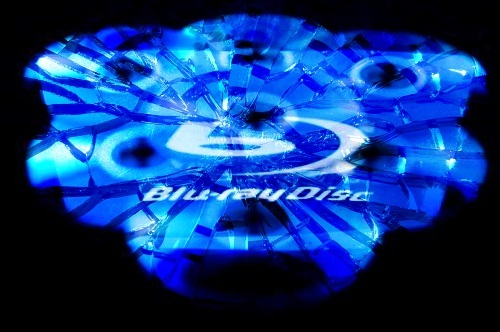 Prices for Blu-ray discs will drop to near DVD price levels. Hope you don’t mind me combining these things, because they essentially amount to “The price of having a Blu-ray setup will continue to drop.” This is true, but it’s not just Blu-ray stuff that’s getting cheaper. As the price of storage and broadband connections drops as well, you’ll find that the increased appetite for Blu-ray devices will be matched by the increased presence of alternatives like set-top boxes and HTPCs. Imagine having an Eee Keyboard reading movies off an easily-set-up home media server and beaming it over wireless HDMI to your big screen. That’s what people see themselves doing in two or three years — they don’t want to do the same crap they’ve been doing since the 80s. 7. Sony will sell lots of PlayStation 3 game consoles. Wow, let me get some of that crack! 8. Sony can’t afford to have Blu-ray fail. If all it took to succeed was the desire to do so, Napoleon would have conquered the world. He threw everything he had at it, as Sony will, but who’s to say when Sony will meet its Wellington? 9. Sony and its partners will figure out a way to have Blu-ray resonate with the public. This is a bit of a leap of faith, and unfortunately I think it’s the same leap of faith people made with the PS3. They’ve tried and failed to make it “resonate”; it’s just not catching. DVD was clearly better than VHS, so it was eventually adopted. Blu-ray is clearly better than DVD, but situation is different because DVD had no agile, popular competitor like iTunes and its brethren. Not only is it too late to make Blu-ray or the PS3 resonate with the public, but the public is already resonating with the seductive vibrations of all-digital media. Don’t get me wrong, I like physical media. I like the boxes, I like the extra stuff, I like the objects. But high-definition video is made for a digital life cycle. It belongs on a hard drive, or in the cloud. I feel differently about e-books, for example; many books and magazines belong on the printed page, although that too is changing. But the optical disc establishment is being torn down and it’s about time. Blu-ray is the last stand and is making a good thing of it, but let’s not be unrealistic in our praise or expectations; why polish the knobs on the Titanic? Why not look towards something new?